‘I started writing crime fiction just as a bit of fun’ says Kjersti Scheen, Norwegian author of a series featuring private investigator Margaret Moss. Scheen has written more than thirty books, mostly for young people, and is the author of an award-winning series addressing issues such as anorexia nervosa and teenage sexuality. Angst-filled letters from readers pour in and she takes care to answer them all. Scheen’s gift for empathy is immediately palpable. She has a lovely, lived-in face etched with humour and melancholy, reminding me of a Jean Rhys woman: sensuous, vulnerable, yet with underlying strength. She lives on the outskirts of Oslo ‘in a red, wooden building in a garden with apple trees’. This is where she grew up, in a household of seven, including her grandmother, ‘all very talkative people’. Storytelling was highly valued, and it was usual for everything to come to a halt if there was a good yarn brewing up. She recalls her brother regaling an early boyfriend with an account of the film they were about to see. On leaving the cinema, the puzzled boyfriend surmised that the movie must surely have been cut – the ‘preview’ had contained so much more action. There are ghosts of the past in the four-bedroomed house she shares with her husband of 31 years. An academic, he has written a number of books on sociology and philosophy. When writer’s block strikes and both get drawn into displacement activities at the same time, they trip over each other in the quest to find the room most conducive to writing. ‘He will open a door and say with dismay, Oh, so you are in here. So, I’ll have to try somewhere else.’ She recounts this in an amusingly indignant, Who’s been eating my porridge? tone of voice. On the other hand, when they’re on a roll, they enjoy the shared sense of productivity. ‘My love of reading is strongly connected to the smell of mildew,’ Scheen wryly observes. ‘That’s because, when I was a child our cellar was full of books. Tolstoy, Ibsen, Dickens, people like that were upstairs in the living room. But down with the washing machine and the jars of home-made jam were the love stories, crime fiction and my father’s cowboy books. I didn’t really know what the difference was supposed to be until I was in my twenties. I loved them all.’ The lines people choose to draw between popular and literary fiction don’t concern her even now, and her reading tastes are as eclectic as ever. Final Curtain is the first Margaret Moss novel in a series that has won a loyal fan-base, particularly in Norway, Germany and Japan. Before she embarked on the project, Scheen immersed herself in work by contemporary female crime writers, an exercise that crystallised what she did and did not want to do. Moss has a weakness for double entendres, alchohol and getting into scrapes. Her teenage daughter has green hair and an unerring instinct for the worst moments to make demands on her mother. Calls of nature are similarly impervious to the requirements of being a private detective involved in surveillance. Scheen deploys these elements with comic effect (although this often has to be inferred from the sometimes very clunky translation). Moss is unencumbered by bourgeois morals. In Final Curtain, she casually beds a plumber who comes to unblock her U-bend and then she encounters Roland Rud, a fading knight of the motorway who obligingly whisks her out of danger. Between skirmishes with sinister yuppies and neo nazis, they hurtle along in his lorry hollering Country and Western. The fact that he singes his moustache every time he lights a roll-up fails to deter our heroine and before long she knows exactly what singed moustache tastes and feels like. Scheen often refers to her own dark side, and so I ask about this directly. She tells me that after her birth in 1943 her mother sank into depression which recurred sporadically for the rest of her life. Fanatically houseproud, loving and sarcastic in turns, when she was low she would shut herself into a room and weep for hours on end. Scheen’s parents emigrated to the United States in the 1930s. Her father was an architect and her mother had hoped to study art, but it was not to be. Before poverty forced to return to Norway, they married in Brooklyn. On their wedding day, they had no food other than a wedding gift of a basket of fruit that had been delivered to their room. Sustained by the thought of the luscious feast ahead, they returned only to discover that the ‘fruit’ was marzipan. Scheen did what her mother never managed to do and went to art college, where she studied book illustration. ‘Drawing was what our family did, it never occurred to me that I should be anything other than an illustrator.’ Only after her daughter was born in 1975 did she really get going with the writing. Her first book, which she also illustrated, is about a little girl who is afraid of the dark, but it turns out that that the troll outside is only a tree and the monster under the bed is only a slipper. 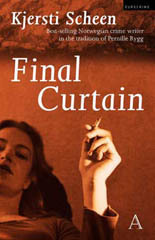 Final Curtain (translated by Louis Muinzer) is published by Arcadia Books (ISBN 1900850591 £10.99 PBK).